P3 Multi-Gauge F8X (M3/M4) - Complete Vent - Right Hand Drive Version. P3 MULTI-GAUGE. If you are looking to get more information in car on what is going on, these gauges give almost everything you could ever want. P3 Multi-Gauge F8X (M3/M4) - Complete Vent - Left Hand Drive Version. P3 MULTI-GAUGE. If you are looking to get more information in car on what is going on, these gauges give almost everything you could ever want. 1 x Smoked face 37mm Digital Turbo Boost Gauge (inc. fitting kit). 1 x Smoked face 37mm Digital Oil Pressure Gauge (inc. sender unit). The pod is built into the gauge and it has a bracket as shown in the picutres. Plugs straight into BMW OBD port. Displays boost, volts & water temp. Black gauge face with silver bezel. Popular 52mm (2 1/16") gauge size. 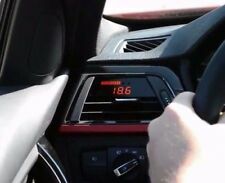 To suit the following BMW's Peak switch displays max values. 1 x Smoked face 37mm Digital Turbo Boost Gauge (inc. fitting kit). The pod is built into the gauge and it has a bracket as shown in the picutres. Turborevs Ltd was established in 2006 out of our passion for modified cars. Item Specifics:2004 - 2013 - 2.0 DIESEL - REAR COIL SPRING -. Part:Rear Coil Spring. This Rear Coil Spring was removed from a2007 car and has been fully inspected. Model:1 SERIES. 1 x Turbo Boost Gauge. Black dial face when ignition is off. LED digital display makes for clear and brilliant definition display when dark. 1 x Silicone Vacuum Hose. Digital display with Blue and Red LED. Item Specifics:2004-2010 - E83 - 5 DOOR - ESTATE - RAIN SENSOR - PART NO 6923954. X3 2004 -2010 Mk 1 (E83). Who Are We?. This Misc. Relay was removed from a2006 car and has been fully inspected. PART NUMBER: 9141042. Our site is spread over 5 acres consisting of a reception area, two large storage buildings, de-pollutions bay, vehicle racking facility, in house crushing/bailing zone. Facilities to collected end of life vehicles. Universal for 12V Turbo petrol vehicles. Power: DC(10-15V) 12V Professional. Illuminated red needle display. 1xTurbo Gauge with Stand. Reads Range: -1~2 Bar. LED display between white and orange light through different wiring connect modes. Tested good working condition check my other listings. 2" (52mm) Turbo Boost Gauge. 1 x Turbo Boost Gauge. LED digital display makes for clear and brilliant definition display when dark. Digital display with Blue and Red LED. Wires connecting : Red - to Ignition Switch ( ), Black - to Battery 12V (-), Green - to Sensor Wire. We take great care to make sure you receive the item as described and in the described condition. ITEM QUANTITY. Gauge May Be Mounted In 2"/52mm Dia holes Or In Auto Gauge Custom Mounted Panels. Attach Nylon Pressure Line To Fitting On Back Of Gauge Using Adaptor ,Ferrule ,And Compression nut. Connect Line To Pressure port On Engine By Using 1/8" Adaptor Ferrule And Compression Nut For Turbo And Prossure Gauge Or 1/8" Adaptor And Fitting For Vacuum Gauge. Item Specifics:1991-2000 - E36 - HATCHBACK - 5 DOOR - CLOCK - 62138362857. This Clock was removed from a1999 car and has been fully inspected. 3 SERIES 1991 -2000 Mk 3 (E36). Model:3 SERIES. 1 x Smoked face 37mm Digital Oil Pressure Gauge (inc. fitting kit). The pod is built into the gauge and it has a bracket as shown in the picutres. Turborevs Ltd was established in 2006 out of our passion for modified cars. Item Specifics:2001-2008 - HATCHBACK - 3 DOOR - CLOCK. Manufacturer:MINI (BMW). This CLOCK was removed from a2004 car and has been fully inspected. This item will be suitable for01 02 03 04 05 06 07 08models. E87 - Bmw 1 Series - 2.0 Diesel - Aux Heater - Part Number 91945950 - Valeo Make - 4 Pin Plug. Aux Water Heater. This part was removed from a Right Hand Drive Vehicle. Compatibility is a guide only. Item Specifics:2004-2010 - E83 MK1 - 2.0 DIESEL - BOOST SOLENOID - ENGINE CODE M47N2D20 - 722796 - 2247906 - 722796-00. X3 2004 -2010 Mk 1 (E83). This Misc was removed from a2005 car and has been fully inspected. Item Specifics:1996-2003 - E39 - 4 DOOR - SALOON - BOOT RELISE SOLINIOD - 8352168. 5 SERIES 1996 -2003 Mk 4 (E39). Model:5 SERIES. Item Specifics:2004-2013 - 2.0 DIESEL - REAR COIL SPRING - PAIR. Part:Rear Coil Spring. This Rear Coil Spring was removed from a2006 car and has been fully inspected. Model:1 SERIES. Part:Rear Coil Spring. This Rear Coil Spring was removed from a2000 car and has been fully inspected. Model:3 SERIES. 2"(53mm) Carbon Fiber A Pillar Pod 2 Hole Gauge Holder Pod Drivers Side/Right side /gauge pod. Each holder is crafted from the highest quality ABS plastic to withstand cracking, fading, and warping. - Note: Gauge is not included. GENUINE BMW 11-15 1 SERIES NOISE SUPPRESSION FILTER AMPLIFIER. 1 x Boost Sensor. Power:DC(10-15V) 12V Professional. 1 x Turbo Gauge(Bar)(-1BAR-1.5BAR). 1 x Mounting Kit Holder Cover. The button on the lens can switch the color of light you want. Right - Plating Black Carbon Fiber steel Car Dual Exhaust Pipe Tail Muffler Tip. 1 x Boost Gauge 3BAR. 1 x Boost Sensor. 1 x Gauge Holder. 2.5m Black Car Front Bumper Spoiler Lip Kit Splitter Valance Chin Protector Kits. Universal Car Seat Seam Wedge Cup Drink Holder Seat Wedge Cup Holder Mount 1x. Function Type: Turbo Boost gauge (for turbo cars). 1 x Turbo Boost Gauge. Adjustable alarm level;. We will reply you within 24- 48 hours. 1 x Power Parallel Cable. 1 x Sensor. 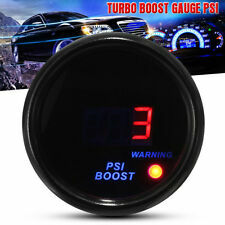 Turbo Boost Gauge 7.7 4 2cm / 3.0 1.6 0.8in. 1 x Boost Gauge 3BAR. 1 x Boost Sensor. Hose, clamp and all the necessary hardware for a complete. Universal setting for: 12 volt cars. 1 x Diverter Tee. Green -- Boost sensor (connect to green wire from sensor). 1 X Turbo Boost Gauge. Red -- 12V accessory Power. Orange -- Head light switch (12V switch power). Power: DC(10-15V) 12V Professional. High quality, durable, waterproof, shockproof. 3" 20W Square CREE LED Angel Eyes Light Bar Spot Beam Motorcycle Work Light. 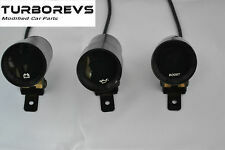 Aluminum 7/8" Bar End Rearview Mirrors For Honda Suzuki Kawasaki Yamaha Harley. High Strength Steel&Rubber Wheel Chain Tensioner Tool Roller For Motorcycle ATV. 2"(53mm) Carbon Fiber A Pillar Pod 2 Hole Gauge Holder Pod Drivers Side/Right side /gauge pod. Brown Breathable Linen&PU Leather Car Front 3in1 Rear Seat Covers Protector Pad. 1Pair 1.5M SUV Car Wheel Fender Flares Trim Protector Strip Carbon Fiber Style. 1 x Boost gauge. 1 x Boost Sensor. Power:DC(10-15V) 12V Professional. 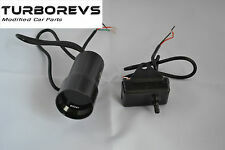 Universal for 12V Cars. The light of the actual gauge may be slightly different from that shown on the photo,Hope you could understand! 1 x Boost gauge. 1 x Boost Sensor. Clear and bright LED Display with 7 colors. The light of the actual gauge may be slightly different from that shown on the photo,Hope you could understand! It is designed as analog/digital dual display. Power: DC(10-15V) 12V Professional. Smoke Tint Lens, Red Illuminated Needle. Moto FRONT Brake&Clutch Fluid Master Cylinder RESERVOIR Res Capacity Pot&Bracket. Universal 1080P 170° Mini Wifi Vehicle DVR Video Recorder Wireless Night Vision. Style :Red Digital Readout. 1 x Turbo Boost Gauge. Black dial face when ignition is off. LED digital display makes for clear and brilliant definition display when dark. Wires connecting : Red - to Ignition Switch ( ), Black - to Battery 12V (-), Green - to Sensor Wire. Green line : connected to sensor. (The compatibility just for reference. 1 x filter. The button on the lens can switch the color of light you want. Racing look enhance the characteristic to your car. ). Direct fits 52mm car gauge (gauge is not included). 1 x Gauge Mount Bracket. Material:ABS Size:52mm. 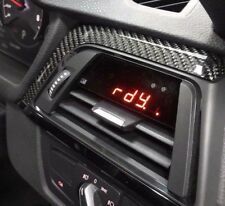 Carbon fiber look, fashion design, mount gauges. Height adjustable, at eye level and you can view it easily. Stylish Red Window Windsheid Trunk Tail Reflective Decal Sticker For MINI Cooper. New Carburetor Carb Intake Manifold Boots Joint for Yamaha Warrior YFM 350 87-04. 28mm High Performance Power Jet Flat Slide Carburetor for Motorcycle Dirt Bike. 2" (52mm) Turbo Boost Gauge. 1 x Turbo Boost Gauge. Wires connecting : Red - to Ignition Switch ( ), Black - to Battery 12V (-), Green - to Sensor Wire. Digital display with Blue and Red LED. LED digital display makes for clear and brilliant definition display when dark. Size：57mm 52mm 38mm. The button on the lens can switch the color of light you want. Racing look enhance the characteristic to your car. Green line : connected to sensor. Housing color : black. (The compatibility just for reference. ). 270 degree sweep. Power: DC(10-15V) 12V Professional. Illuminated red needle display. Universal for 12V Turbo petrol vehicles. Light Colour: White Orange. LED display between white and orange light through different wiring connect modes. 2"(53mm) Carbon Fiber A Pillar Pod 2 Hole Gauge Holder Pod Drivers Side/Right side /gauge pod. 2Pcs H3 COB Car Auto LED Light Fog Lamp Xenon White 6000K Parking Driving Light. Car Exterior Door Handle Sensor Switch For A1 A4 A5 A6 A6L A8 Q5 4G8927753.